OK as I’m in the French Alps I NEED Alpine food. It’s the law! I’m talking full on cheesy winter warming food here my friends. The sort of food that stokes and fuels you for cold winter days when hearty warming dishes are where’s it’s at. 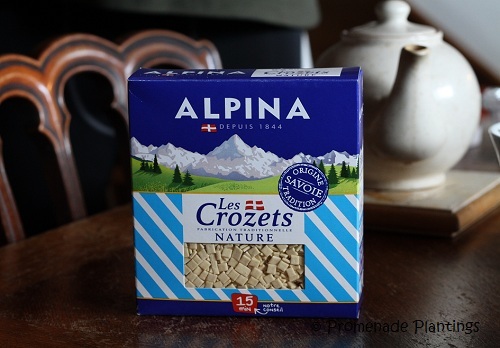 The ingredients for today’s spectacular are regional, but don’t worry if you are in the middle of the Australian Outback or Arizona desert and you can’t buy Crozets, a wheat based small shaped and flat style pasta will work well. Reblechon a classic Savoyard cheese is traditional but if you are living in downtown Belarus or a suburb of Santiago and can’t get it don’t worry make the dish with a good Brie or Camembert they are great alternatives. When I originally wrote this post I was coming to the end of my winter soujourn in the French Alps, tucked away in a teeny apartment, snug and warm, having recovered from a fractured shoulder and torn muscle sustained from a fall on the slopes earlier in the season. My all that seems so long ago doesn’t it. Let’s take care out there folks! As I’m back skiing I need (read want) hearty mountain food and what better than a winter warmer with a vegetarian twist on an Alpine favourite. 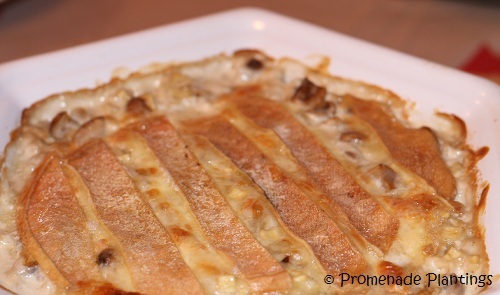 Tartiflette is a popular Alpine dish – a classic of Reblochon cheese, potatoes and cream. I made a vegetarian version earlier in the season and have planned todays dish ever since. I’ve always seen Crozets in the shops and wondered how to use them. They are teeny-tiny pasta squares. I don’t know their history for certain – maybe a link in the past to the former rulers of the Savoie – the Savoy Princes and the Italian culture and connections? Whatever their history they are popular. We have a weekly market here, a mix of fruit and veg stalls, sellers of honey, cakes, nougat, household goods, and mountains of meats and cheeses. 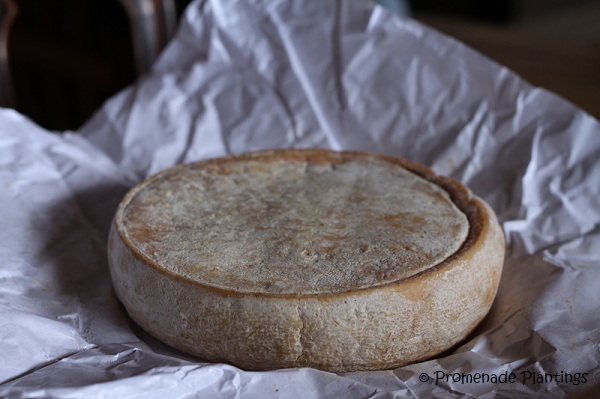 I buy cheese from local producers and Reblochon features heavily, this cheese originates only a few miles from us. And this cheese has sat in our fridge ever since, waiting for its big moment. 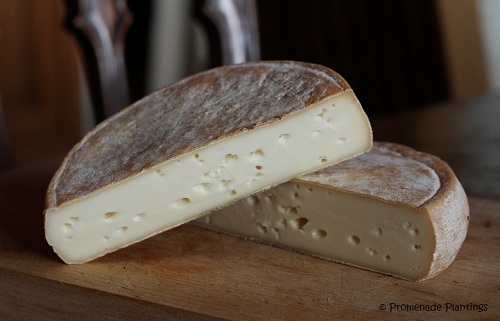 The quality of this Reblochon is superb, we’ve nibbled on a few pieces and it’s delectable – rich and creamy. And the beauty of both Tartiflette and Croziflette is that the rind is used – that’s where all the flavour is. READER WARNING – If you are on a diet, not taking much exercise and care, I’d look away now, this recipe calls for half a Reblochon, and a heap of creme fraiche. See I told you to look away. If on the other hand you don’t care, or are planning on ending your diet, bookmark the recipe. In a large pan, gently saute the onions, garlic and mushrooms (or lardons if using) until the onions are translucent and the mushrooms are cooked. I added a splash of white wine at this point to help get the moisture out of the mushrooms. When the vegetables are cooked, turn the heat off and add the pasta and the creme fraiche and combine all the ingredients and then pour the mix into a baking dish. On a chopping board cut the Reblochon in half, and the slice the rind off both sides, make the slices fairly thin and put them to one side. Now cut the remaining cheese (the bit without the rind) into small chunks and add it to the pasta, mix it in well. Use the slices of the Reblochon rind to cover the pasta, you can cut them into strips. 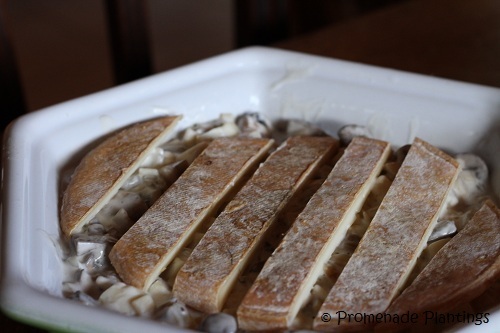 Place in a hot oven (Gas 6 / 200 degrees) for approx 20 minutes or until the cheese on top is browned and bubbly. We ate this with a green salad and a dish of buttered green beans, all washed down with a hearty red wine. Bon Appetit! Brr … all that snow. I was snowed in last week because the alley behind my drive was not plowed so I am not too fond of snow these days though the snow covered pine trees look quite scenic. I guess after expending all that energy on the slopes skiing, you can afford to indulge in that rich dish but I’ve got to give it a pass. 🙂 No Reblochon in my area in any case. Brie and Camembert are good substitutes for Reblechon ) But I understand if you feel you haven’t expanded the energy! Good to hear you are now ploughed out! Hmmm….a Grown-up Mac and Cheese? I’m in! Gawd, but I miss Reblechon…and France! Maybe in June, if all goes well! Yum! Anything with cheese and pasta is popular in our house! 😀 Happy skiing! Oh French cheeses…yum. Enjoy your skiing. Thank you Karen, as you know there are so many to cheeses to choose from it’s hard to know where to start ! How lovely for you to be away and skiing and enjoying the snow! The recipe sounds delicious – we love cheese! Is there a measurable effect global warming Alpine glaciers and such ? No matter where you are, your version of Mac n cheese sounds delightful made all the better by enchanting vistas. That looks amazing Claire! I’ve never tasted Reblochon before. Looks like I need to find some and try it :). Good and hungry is good! and you are right it’s an alpine style macaroni cheese 🙂 Happy days! Oh my goodness does THAT look tasty! Hi Jen and many thanks – it’s certainly rich and filling! This recipe sounds wonderful! I love to hear from you from the Alps…somewhere I’ve always wanted to visit…happy winter! Good evening Cindy, I hope all is well with you and thank you for your kind thoughts and words, I’ll readily admit to loving my snow fix time in the French Alps/ and I hope one day you get here, I had a lovely chat with a group of Canadians today(retirees) they do alternate ski trips in N America and France – and yes they were having a ball!! The joy of thick clothing eh?! I do hope you find some good cheese, nice and rich and full flavoured! What a divine recipe! All that melted cheese is just breathtaking! I’m sure you will burn off all those yummy calories! Have fun Clare! I didn’t look away quick enough and then I was sucked in by the thought of all that gorgeous CHEESE! Oh yum, cheese heaven. Maybe I could make this and then just take the pups for an extra long scamper? And I tried to find another word to top my use of the word salopettes, but drew a blank but I will say to you “bend ze knees”! 🙂 then of course there is “on piste” just add a the into the middle and away we go ! Such a beautiful photo Claire. I do hope your time in the Alps are healthier this year and no fractures have taken a toll on you. This dish does indeed look very decadent, and delicious. A real treat after a hard day on the slopes. I must bookmark it for one of those days. I think this is what heaven must be like. 🙂 that and some good wine, good company……. I think that’s when we did connect Debra, it’s funny as we are back in the old apartment – everything is so familiar – from the view out of the window to the cranky oven! Ohhhh, yes, please! And seconds (and thirds)! Lovely to hear from you, and so different from your part of Spain! Oh, that dish looks just like the kind of comfort food by body is craving right now! Yes, it’s craving rich, fatty, delicious foods! 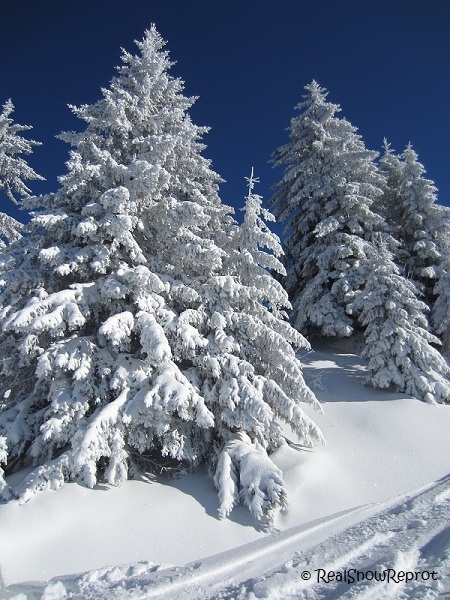 Gorgeous photo of snow-filled trees. Delish! Enjoy the fresh air and snow and great skiing. Your snow is stunningly beautiful! Thank you so much for my birthday wish!!! relieved to know that pasta works well… enjoy your time there… sounds just the place to be right now. After a Christmas holiday spoilt by illness it’s a relief to be well again and active! Bookmarked and can’t wait to come off my diet !!!!! Oh this will be a TREAT after finishing a diet Valerie! Well that is absoultely beautiful! The cheese alone made me drool. So you get to ski all day and then you get to eat more because you skied? Life is good. BTW, I recently read that you can use Crozets as a substitute for couscous. This just makes me want to go to the Alps too! It is drool-worthy for sure.